Sulcorebutia rauschii f. aureispina hort. Sulcorebutia rauschii f. cristata hort. 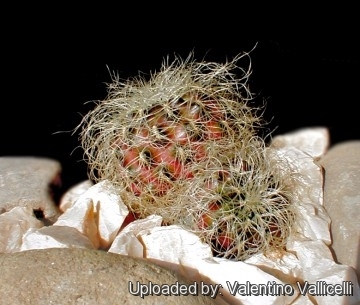 Weingartia rauschii f. cristata hort. Sulcorebutia rauschii f. violacidermis hort. Sulcorebutia rauschii f. viridermis hort. Rebutia canigueralii subs. rauschii f. viridis hort. Sulcorebutia rauschii f. viridis hort. Sulcorebutia rauschii cv. Green Form hort. Weingartia rauschii f. virididermis hort. 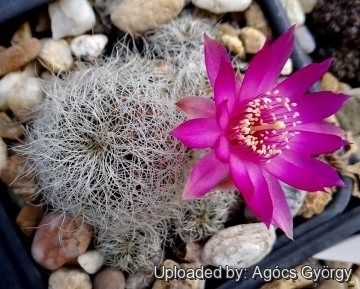 Sulcorebutia gerosenilis var. patricii hort. 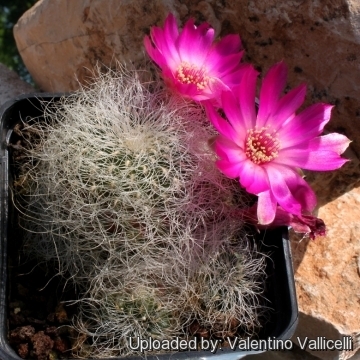 Description: Sulcorebutia hertusii is one of the local form of the very variable Rebutia canigueralii subs. crispata. 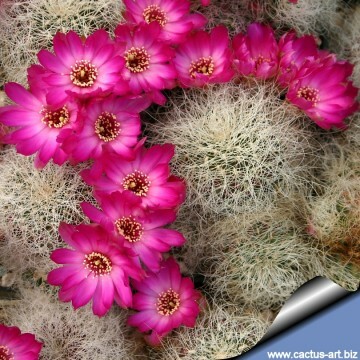 Distinguishing characteristics: It distinguishes from Rebutia canigueralii subs. 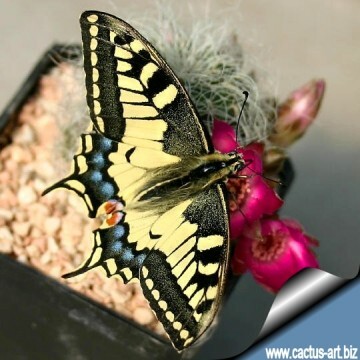 crispata for the small globular bodies nearly obscured by longer, interlaced, ivory-white or yellowish hairlike spines, which are flexible and more or less twisted. This is a very distinctive plant even without flowers. Sulcorebutia patriciae and Sulcorebutia gerosenilis are almost identical and not easily separable by any character from the standard hertusii, if not for the geographical provenance. Habit: It is a slow growing clustering cactus that may forms large mound of many heads and these are practically level with the soil in habitat. Stem: Rapidly offsetting from the base, small, grey-green, green to dark purple. A characteristic of this species is that the offsets often develop roots while still attached to the mother. Individual stems 2(-4) cm tall, 3(-5) cm in diameter. Ribs: With raised tubercles (3-5 mm wide). In older plants tubercles are arranged in up to 13(-16) spiral line merging in the apex. Areoles: 3 mm long, narrow with short white felt. Flowers: From the basal part of the stem, 20-50 mm long, 35-50 mm wide cherry-red or dark magenta with pale centre. Floral tube funnel-shaped yellowish-green or yellowish-red with tan coloured scales. Phenology: Flowers are produced in spring and remain open for three or four days. Fruit: Dark brownish red approx 4-5 mm wide. Rebutia canigueralii Cárdenas: Slow growing clustering cactus that may forms clumps of many heads. This is a highly variable species with several forms with light green to purple colouration and small spines. Flowers mostly bicoloured orange, red or purple with a yellow throat, but the amount of red vs. yellow varies widely. 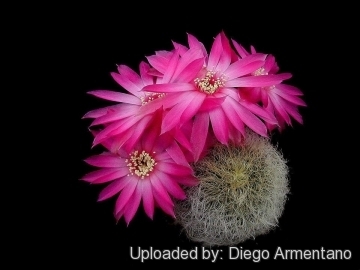 Rebutia canigueralii subs. crispata (Rausch) Donald ex D.R.Hunt: Forms small globular bodies nearly obscured by a variable ivory to golden spination. Spines are pectinated, bristly, flexible and more or less curved. Freely clusters to form large mounds. Rebutia pulchra Cárdenas: Stems 40-50 mm Ø, dull olive-green with violet. Radials 10-12 yellow/brown, fine 2-4 mm long. Centrals usually absent. Flowers magenta, red or bicoloured. Distribution: Chuquisaca, Bolivia. Sulcorebutia callecallensis (F.H.Brandt) Pilbeam: has tiny clustering stems, short, pectinate adpressed spines and outstanding bicoloured yellow-red blooms. Distribution: Cerro Calle Calle, Chuquisaca. Sulcorebutia canigueralii var. applanata (Donald & Krahn) Horáček: has small, dull grey-green stems, rapidly offsetting from the base, Flowers bi-coloured yellw-red or purple. Distribution: Cerro Churuquella, Sucre. 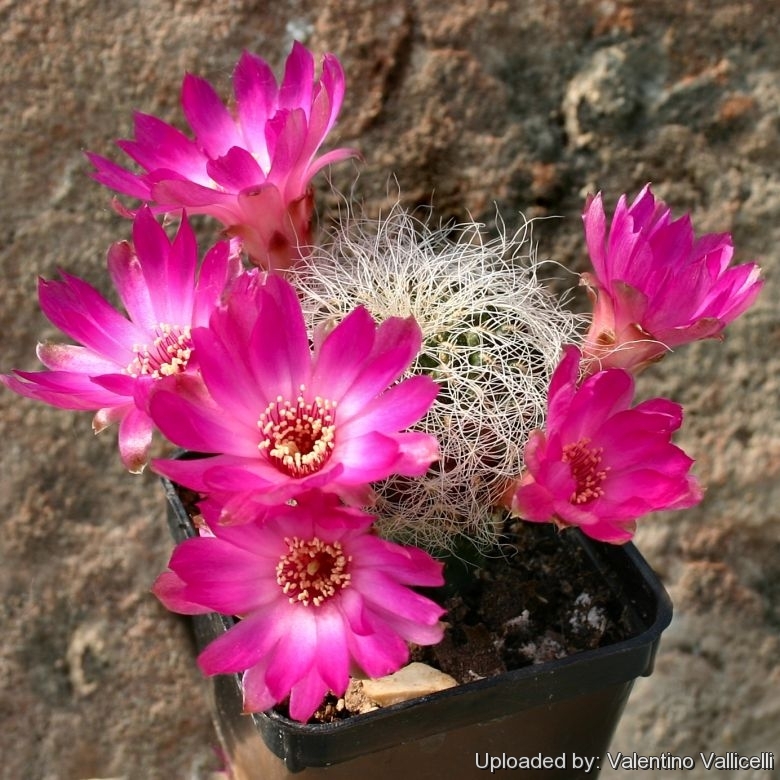 Sulcorebutia frankiana Rausch: has small-bodies with fox-brown spines and pink to magenta flowers. Distribution: Sucre to Los Alamos and adjacent areas, Chuquisaca, Bolivia. Sulcorebutia gerosenilis ?íha & Arandia: Same as Sulcorebutia crispata v. hertusii. Sulcorebutia hertusii (Halda & Horáček) Halda & Horáček: Body dark-purple coloured covered by hair-like, white or yellowish, twisted spines. Sulcorebutia losenickyana Rausch: has bristly, tight, pectinate spines, pointing diagonally and downward, partially interlaced. Whitish with brownish base, but also golden, brown or almost black. Distribution: Chuquisaca and Potosí. Sulcorebutia pasopayana (F.H.Brandt) Gertel: A small-headed low growing, mound forming, cactus that forms large clumps, sometime with hundreds of heads. The flowers are blood red. Sulcorebutia rauschii G.Frank: Stems highly coloured in purple with very small dark pectinaded spines. Flowers magenta. Distribution: Zudañez, Chuquisaca. Sulcorebutia rauschii f. aureispina hort. 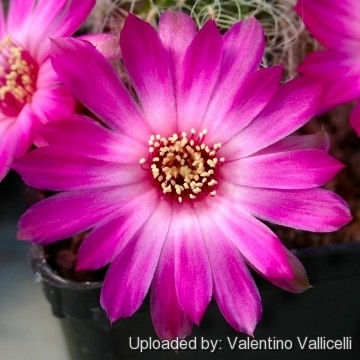 : This form has short yellow pectinate spines on a mauve body. Distribution: Zudañez, Chuquisaca. Sulcorebutia rauschii f. cristata hort. : Crested form. Sulcorebutia rauschii f. violacidermis hort. : Beautiful selected form with nice and distinctive dark violet body. Distribution: Zudañez, Chuquisaca. Sulcorebutia rauschii f. viridermis hort. : Green form. Distribution: Zudañez, Chuquisaca. Sulcorebutia tarabucoensis Rausch: has globular stems with a long taproot. Radial spines bristly to 10 mm long, cream or yellowish, pectinated. Blooms red or dark magenta. Distribution: Tarabuco, Chuquisaca, Bolivia. Sulcorebutia tarabucoensis var. aureiflora (Rausch) K.Augustin & Gertel: has yellow or yellow and orange red flowers, grey-green epidermis, and yellow to white spines up to 10 mm long. Distrtibution: Tarabuco and adjacent areas, Sucre, Bolivia. = Sulcorebutia callecallensis. Sulcorebutia tarabucoensis subs. patriciae B.Bates, Halda, Heřtus & Horáček: Spines yellowish brisly, hairlike. This plant is very similar (if not the same) to Sulcorebutia crispata v. hertusii. 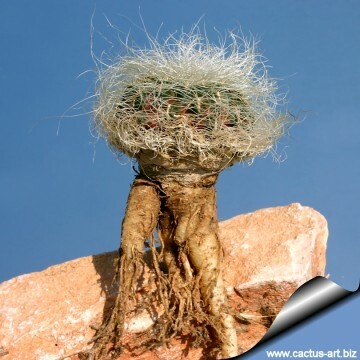 Cultivation and Propagation: These mountainous plants have thick taproots and are susceptible to overwatering. They loves a very permeable, coarse mineral soil as well as to be strictly kept dry throughout the winter quiescent period since it is very sensitive to any moisture excesses, To prevent rottenness it is also advisable to surround its root neck by very rough sand or grit, this help a fast water drainage. They requires also an appropriate air circulation and are sometime grafted to avoid root problems. They need to be kept in a cool place during winter rest (at 0-10°C). This is important for the flowers ,as well as for their health. Without this cool winter period, they normally won't get any buds.